First off, let me apologize for the delay in getting this post up! I was having issues with my host, Hostgator, and then ended up moving to a new hosting company. With all the craziness, I forgot about this post in my drafts! Better late than never though! Let me refresh your memory. 25 readers sampled the new Hawaiian Tropic Silk Hydration SPF 30 Sunscreen Lotion and Silk Hydration After Sun Moisturizer. 17 of them sent me their reviews after they had a chance to try it out. Here’s what they thought! 1. Jaimee A: I thought the smell was amazing and not too overpowering. I wore it as I went out to the park with my son. It absorbed perfectly into my skin and I didn’t get the ‘super sweats’ I usually do from wearing sunscreens or tanning lotions. I was pleasantly pleased. We were out for about three hours on a sunny hot day, and I wasn’t burned at all. I didnt get hot spots on my skin where it was burned, because SURPRISE! I wasn’t burnt at all. The lotion did its job well. Now onto the Silk Hydration After Sun Moisturizer! I applied this after I got inside from the sun. I put it on both my son and myself. He liked the mini massage, and I again, enjoyed the lightly tropical smell. It went on smooth and left my skin SOOO soft. Very pleased with the outcome. Will be buying both products when the samples run out since we’re going camping next week. I think the After Sun Moisturizer would also be good as a replacement for my daily moisturizer, nice scent, and left my skin moist without feeling sticky or greasy! 2. Pamela S: I received samples of Silk Hydration SPF 30 Sunscreen and the new Silk Hydration after sun moisturizer. First let me tell you, they both smell AMAZING! I couldn’t wait to try them out. We lucky had some hot sunny days over the weekend. I applied some Sunscreen in the morning. I was pleasantly surprise that it was not greasy and was easy to apply. After a few hours in the sun, I did not have any red skin even after having the suns rays reflect off the water onto me for some time. At lunch time I applied some of the after sun moisturizer. Again, nice to apply. My skin is very soft after using my Hawaiian Tropic team. I will DEFINITELY be buying more! 3. Rene B: Let’s face it – headed out for a day of summer fun with 2 small children is anything but glamourous. Packing a lunch, wrangling kids into clothes and hats, and then dousing them in sunscreen all add to the pre-game joys. The two minutes I have alone is spent smearing greasy/sticky sunscreen on myself and then ensuring a good hand wash so that I can actually open the bathroom door! With Hawaiian Tropic Silk Hydration products, now I can have those two minutes be luxurious – and I need sunscreen anyways, so it’s not so indulgent that I feel guilty. I love the tropical scent and the elegance of the moisturizing ribbons through the bottle. Better yet, the truly hydrating SPF30 sunscreen lotion absorbed almost instantly, leaving me just slightly tacky – I hardly felt like I was wearing sunscreen at all! Paired with the Silk Hydration After Sun Moisturizer, the whole experience was delightful. I found the Moisturizer’s coconut papaya scent to be really pleasant and not too overpowering. I love all things coconut, so it was perfect for me! As with the sunscreen, it absorbed really quickly – which is key for this mom on the go. I will definitely be using these products going forward – and hiding them from the family! 4. 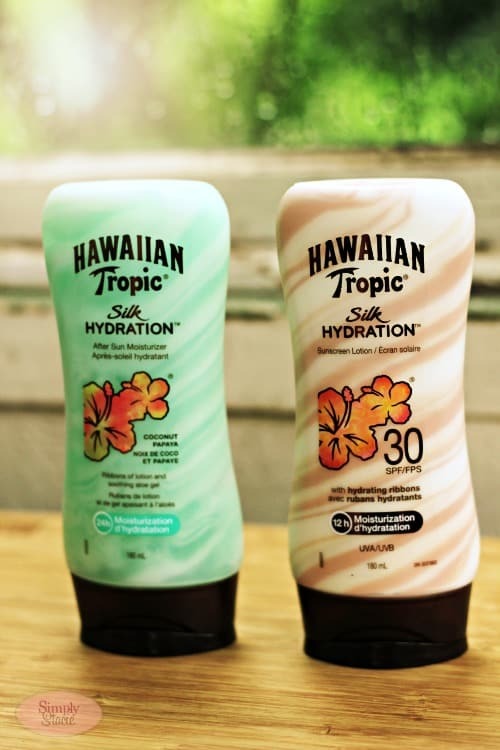 Jeff C: I had the chance to try out both products of Hawaiian Tropic. I applied the sunscreen before going to the out to the.park. I found it was easy to apply and absorbed quickly. The texture was light and non greasy,and the best part no sunburn. Next I applied the after sun moisturizer,the lotion was light and the scent airy, as though I just came from a tropical island. I do recommend Hawaiian Tropic products,and I will be purchasing them as well, in the near future. 5. Suzanne S: I should begin by saying that you could not have sent the Hawaiian Tropic Silk Hydration products to a better husband and wife team to test upon. We live in the VERY sunny and hot Okanagan and it is now mid-July with temperatures reaching 38°C each day. I am the pickier consumer in the family and I checked out pricing at my local Target: comparable to other major brands. Sizing of full size products: good range. The scent was coconut-ty great and drove me bonkers. The dogs wanted to lick my legs they thought it smelled so good. Most importantly I was worried about break outs and so far, so good. Like my husband, I was quite pleased that my skin wasn’t aggravated. Furthermore, I have Acne Rosacea and must be very careful with what I apply to my skin, I think I would trust this product based on my trial of Hawaiian Tropic Silk Hydration. Suzanne also sent us this fun pic of herself keeping her skin safe from the suns rays. 6. Jan L: I think I may have found my new favourite Sunscreen! The Hawaiian Tropic Silk Hydration Sunscreen Lotion applies like a moisturizer which is fabulous. With other sunscreens I am not sure whether I am applying enough or getting coverage in all areas as it is so thick and difficult to disperse. I loved the scent, but am sure that a non scented one would be appreciated for those days/evenings when you would like to where a perfume. The Hawaiian Tropic After Sun Moisturizer felt a little sticky which I did not like. I’m wondering if this may be due to the aloe. To date I have not received too much sun, (and I don’t intend to!) so I haven’t experienced the cooling/soothing properties. Again, the tropical scent is very light and I like it, but a non scented choice would be a good idea. 7. Melissa F: Hawaiian Tropic Silk Hydration Sunscreen- I love the lightweight composition of this sunscreen. I have avoided putting sunscreen on my face in the past because I hate the way it feels and looks. But this one was completely different. I didn’t even know I had it. It feels just like a moisturizer. The smell is so unbelievable that it instantly transports you to a tropical island. It made my skin feel very soft. I also love that it is waterproof and protects against both UVA and UVB rays. Hawaiian Tropic After Sun Lotion- It also smells great, is non-greasy, moisturizes but is lightweight. It actually softened my skin. Love that it contains aloe which is so soothing to your skin after a day in the sun. It actually cooled my skin. I will definitely buy both of these products for myself. Thanks Hawaiian Tropic and Simply Stacie for the fab sampling opportunity! 8. Lorinda S: I had an annual family bbq to go to and I thought that that would be the perfect time to try out my samples. I love the swirl..lol I thought it was just packaging but there is an actual swirl..lol Then there is the scent, Hawaiian Tropic just smells like summer. As soon as I applied the sunscreen I could see the difference on my skin, dry to hydrated. It went on really well, not greasy or sticky. I did go swimming so I got my 3 year old cousin and lathered him up and let him play and swim. I reapplied twice and at the end of the day we both put on the After Sun…LOVE! Cooling and soothing, again not greasy or sticky and we both thought it felt great. Hawaiian Tropic has 2 new fans, my lil cousins’ mama and me! 9. Tara C: I Love Hawaiian Tropic probably the best out of all of the sunscreen lotions. You can count on not getting burned at all especially if your as white as me and is easily able to get burned. 10. Christy M: I really liked the Sunscreen Lotion. It was easy to rub in and my skin did not feel tacky throughout the day as some higher SPF brands do. I also, loved the moisturizing benefits, which allowed me to skip my regular daily moisturizers, including my face. I especially loved the after sun moisturizer! It was refreshing to put on after a day in the sun. I am not sure which bottle I will get through first! 11. 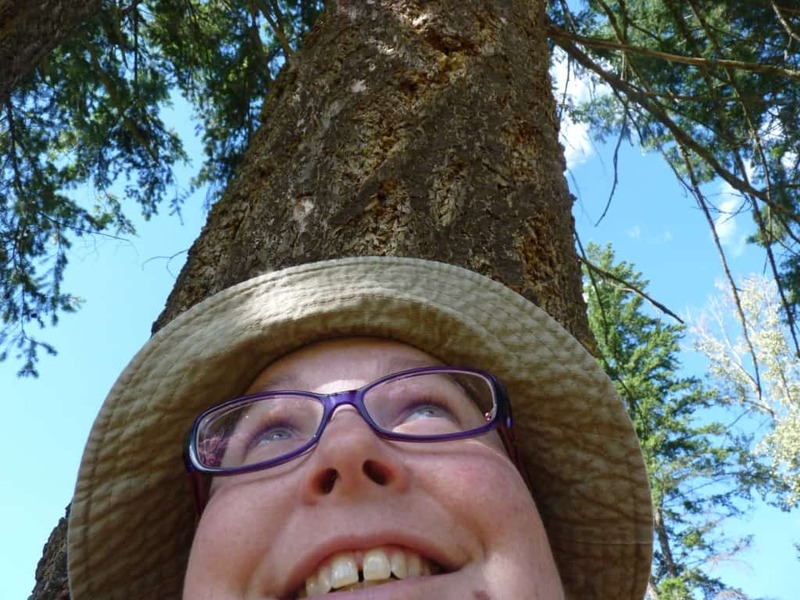 Tammy B: I did receive my samples and used them on a day trip to our favorite spot here in Manitoba. We were in the heat and sun for a better part of 5 hours and it was Hot!! I applied the Silk Hydration SPF 30 Sunscreen prior to getting in the sun, the smell made me feel like I was in the tropics, the lotion was so smooth and a little went a long way!! I love the ribbons and could tell that it was not only protecting me from the harmful rays of the sun, it was also keeping my skin moisturized, which I loved!! I re applied twice after getting out the pool to assure I was still protected. I managed to get a wicked tan that day and did not burn at all!! After getting home and showering, I applied the After sun Moisturizer, and my skin thanked that little bottle!! I was so impressed with the feeling, not greasy at all, smells absolutely amazing and hydrated my skin wonderfully. Since trying these 2 incredible products I have gone out and purchased the bigger bottles, my two daughters love them as well!! Thank you for letting me try these, they are part of my summer now every year!!! 12. Amanda F: I was excited to try the product out! I can honestly say that even though I always put sunscreen on my kids, I am not very good at protecting my own skin. I thought this might help with that because it’s like an adult version of the stinky sunscreen I put on my kids. It’s very pretty and smells awesome. The day before my sample arrived I actually got burnt pretty bad at the beach so I was VERY thankful to have the after-sun sample. My kids loved the smell too and kept asking for some as well. After that day I have been using the sunscreen when we go out and I just love it! 14. Rose D: It is yet by far the best sunscreen I have used. It is so silky and soft and leaves my skin so velvety and fresh. I love the smell of it, and what a great product for sunscreen users to have all the above in one. I have already purchased it and thank you for sending me a sample. It really helped with my decision after the first use. I have told my family and friends about it. My aunt is away in Italy for the summer and she actually bought 2 bottles of this as I have asked her to try my sample and she was quite happy about it. 15.Carla D: I fell in love with the texture and feel – both light, very moisturizing without leaving a greasy feeling. The scent was very pleasant. I really enjoyed using them!! I didn’t feel like I was using just a regular sunscreen and aftercare but a very luxurious cream. 16. Debbie S: I loved this sun block! I have fair skin and need to wear some type of protection. Lately I’ve been using an aerosol sun block which reeks, so this was a delightful change. It looks so appealing in the bottle and smells delicious. I really appreciate the opportunity to try it out and will definitely recommend this to friends and family! 17. Christina S: First of all I’m thrilled that I got the chance to sample these two lotions because I’m now hooked! I’ve used them everyday and now I’m gonna have to go buy some! The sunscreen lotion is unlike any sunscreen I’ve tried before, it smells AMAZING lot like the typical “sunscreen” smell I’m used too, it goes on smooth, not sticky and slimy like other lotions. My daughter loves it to and goes for the bottle every time before we are about to go outside. the after sun lotion I love as well, like the sunscreen it smells so yummy! I’ve been looking for the perfect after sun lotion for a while now and it looks like I’ve finally found it, it’s soothing and moisturizing, it’s unlike any after sun lotion I’ve tried before. Definitely a keeper!! Thank you for the opportunity to try these products, they have definitely won me over, I will be buying these from now on! And finally, the winner announcement! 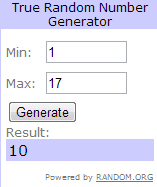 The lucky winner of the $50 Visa Gift Card is….. Thanks to everyone for sending in your reviews! It was neat to hear how you all liked the products. I would like to try this for sure as I am out in the sun every day. Congrats to the winner! Sounds like a couple of great products. I’m so glad that they aren’t greasy and smell nice. Sun care is important every day, but you don’t want to go out smelling like you just applied sunscreen on looking/feeling oily. I like that these are lightweight and hydrating while protecting you from the sun. Congrats to the winner! Those products do smell very good!! I tried this sunscreen out this summer and I loved it!